Shortlisted for the Costa First Novel Award for 2016. **A TIMES and INTERNATIONAL BESTSELLER** A brother chosen. A brother left behind. And a family where you'd least expect to find one. Leon is nine, and has a perfect baby brother called Jake. They have gone to live with Maureen, who has fuzzy red hair like a halo, and a belly like Father Christmas. But the adults are speaking in low voices, and wearing Pretend faces. They are threatening to give Jake to strangers. Since Jake is white and Leon is not. As Leon struggles to cope with his anger, certain things can still make him smile - like Curly Wurlys, riding his bike fast downhill, burying his hands deep in the soil, hanging out with Tufty (who reminds him of his dad), and stealing enough coins so that one day he can rescue Jake and his mum. 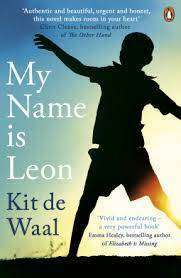 Evoking a Britain of the early eighties, My Name is Leon is a heart-breaking story of love, identity and learning to overcome unbearable loss. Of the fierce bond between siblings. And how - just when we least expect it - we manage to find our way home.